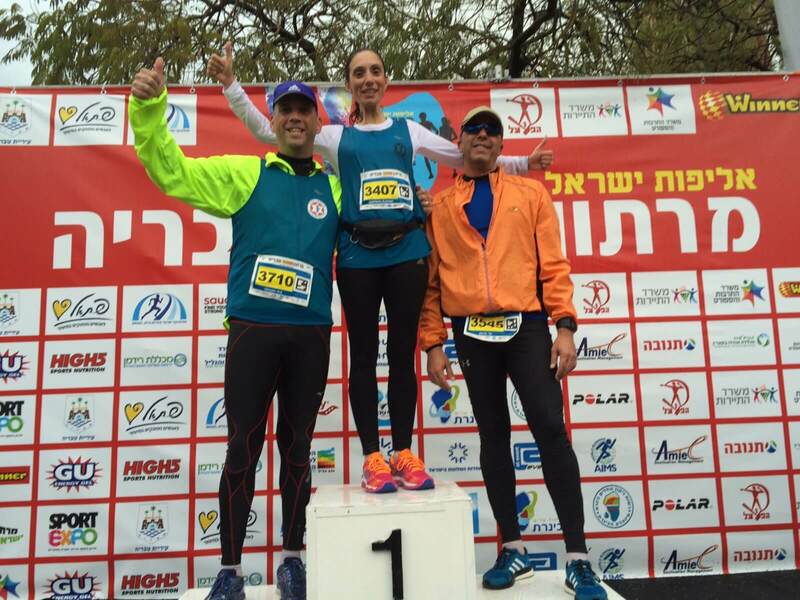 “The Tiberias Marathon: My muddy mid-life crisis” – Impressions after running the “Tiberias Marathon” for the Benefit of ZDVO/Beit Halochem. The “Sea” of Galilee or Kinneret is in fact not a sea but a lake and hence makes an ideal location for first time runners and marathoners. The course is below sea level, flat as a billiard table (except for one small hill – but more of this later) and is cool in winter. This is an out and back 42.2km course, starting in the resort town of Tiberias, circling half the lake and then returning to end where the race had begun. Rain was forecast and that night my sleep was rudely interrupted at 03:00 by the rain and wind hammering against the metal shutter screens of our apartment. The forecast rains had come early. No sooner had we boarded our rental van and started heading down the hill to the start line, then on cue the sky erupted with pelting rain. By the time we reached the bottom of the hill the parking lot was awash and cars jostled for the few remaining spaces within reasonable distance of the start line. In desperation, I reverse crash mounted a kerb as my wheels spun in the wet. I was sure that no self-respecting Woollahra Council infringement officer would venture out in these conditions, and if their Israeli equivalents were game enough, they deserved the additional revenue. A taste of what was to come confronted us as we ran for shelter across the parking lot. The storm drains could not handle the deluge of water and we soon found ourselves running up to our ankles in water. The race had not even begun and already our shoes were water logged and squelching. In the hotel we faced a state of disarray as the foyer was packed with expectant runners seeking shelter. War, explain how Beit Halochem had become his second home. With Norman, his black Labrador by his side, Danny gently shared that restorative surgery had granted him one week of vision, the first and only time he had seen his wife and four kids. This had not stopped him from participating in triathlons or accompanying our own Alan Wahlhaus as he rode in the Courage for Motion cycle. However Danny and the other Jerusalem athletes would be stopped from participating in the Tiberias marathon on this occasion because budgetary considerations had denied them the opportunity to participate alongside my family. Instead we would join the Beit Halochem team from Haifa. None of the team had shied away from the weather and together we posed for the pre-race photos. Then I rushed out of the shelter of the hotel to the start line. What confronted me beggared belief. The electronic starting mats had been washed away in the swell of muddy waters that had rushed down the hill. The start was delayed as race organisers fished the mats out by their electronic cables and relocated them 30 metres further along on higher ground. Whilst we awaited the start I looked around at the bedraggled field that surrounded me. Some had refuse bags, others were soaked to the skin and only had their normal race gear – I wondered how they would avoid hypothermia as you needed enough fuel over several hours just to keep you moving forward without having to use it to keep warm. My race strategy was simple – run the first 5km’s and hope that the pain in my left knee would subside. It was a year to the day since I had fallen skiing in Switzerland and snapped the cruciate ligament and torn the meniscus and medial ligaments in my left knee. I wanted to prove to myself that I could bounce back without reconstructive surgery. But the training had not gone to plan and my damaged left knee had started swelling. This had plagued me for the past several weeks and had made any training impossible since we had left Sydney before Xmas. My friend and physio Larry, procured anti-inflammatory tablets from an Israeli pharmacy over WhatsApp and they had become my meal-time supplements for the past week. If I made it through the first 5 km’s then following the guidance of Mark Davis, veteran of over 114 marathons and organiser of the Wednesday running group I had joined, I should just aim to finish and not worry about my time. Then suddenly we were off. We had covered less than 100 metres, when we encountered our first obstacle – the entire road was flooded with brown swirling water. The one disadvantage of running below sea level, is that on the rare occasion it rains, every drop of water heads to the lowest point. The man in front of me lost his footing and plunged head first into the muddy waters. This was not going to work and I realised that the only way to get around this was to head for higher ground and soon found myself crab running in single-file along the edge of the sidewalk, precariously balancing on the concrete edging that flanked the muddy ground. Each time we reached a dry section we would hop off the island and re-join the road. Along the route supporters huddled under umbrellas and cheered us on with shouts of Kol Hachavoed or literally “all honour to you” or more accurately “Good on you, mate”. I understood little of what the runners around me where saying but grasped the occasional snippet as they joked amongst themselves. One mumbled something about Mored HaGeshem (the prayer for rain) and as the ferocity of the rain increased I heard another call out “Selachti” – the word taken form the prayer for forgiveness on the Day of Atonement, Yom Kippur. The camaraderie was incredible. At each water table there were small pink coloured plastic bottles of water with screw top lids. In Israel water is precious (although on this day one could have been forgiven for wondering why) and after taking one or two swigs a runner would offer his bottle to those around him, with a call of mayim, mayim. In this way I found myself sharing drinks from the lips of complete and sweaty strangers. As we crossed the timing mats at the 15km mark the leading Kenyan runner flashed past me in the opposite direction. He had already covered 27 km’s in the time it had taken me to cover 15. The beauty of an out and back course is that you get to see each runners progress – both those ahead and those behind. I marvelled as each of the first 6 ran passed, all either Kenyan’s or Ethiopian runners and all wearing nothing more than their race singlets and skimpy shorts. Had someone forgotten to tell them about the weather conditions that day? Were we really doing the same event? They were gliding and I was stomping – I consoled myself with the thought that if runner number 1 put runner number 2 on his back and ran, their combined weight would probably match my own – then it would be a fair contest – then again on second thoughts I think they would still beat me! I had only once managed to run 30 km’s in training and then under the careful tutelage of Eitan Franklin, who had guided my every step. I could feel my pace and stride starting to falter by the 26km mark. Then an angel arrived in the form of Sharona Shalev Mayer. She was one of the race pace setters and emblazoned on the back of her red Saucony shirt was the time 4:15. Her role was to lead and guide a group of runners aiming for this finish time. She had collected a motley crew of about 12 runners around her. I remembered the sage advice of Michael Hurwitz that I should try to find runners whom I could stick with and mimic their pace. This was my only chance and I fell into the group and sat right on Sharona’s heels. Just as Eitan had done in Sydney, Sharona became my metronome. She ran with an easy, rhythmic and steady pace and after a while I found myself just following her footfall. Moreover as we approached each drink station she would dart in to the crowd and emerge with a handful of water bottles and gels (or Jellim as the others referred to them) leaving us to continue at our steady pace as she quickly reassumed her position at the front of the pack. This was the ultimate race domestique. The kilometres seemed to fly past and at the 29 km mark there was a chorus of “Barmitzvah”, from which I understood that we only had 13 km’s to go. Suddenly the rain did not seem to be such a problem and as we ran past the gates of Degania Aleph and Degania Bet,the first Kibbutzim in Israel, I thought back to the last time I had visited them as a school boy 35 years before and my pride swelled. For the first time I thought I might actually finish this event. Just before the 34 kilometre mark we approached the only small hill on the course. I was determined not to lose my new race buddies from whom I seemed to draw some invisible strength. I am not sure if it was the additional effort or that I simply “hit the wall” as it is described in running parlance, but as we crested the hill I felt my hamstrings and calves start to cramp. I could no longer maintain the steady rhythm. We had been running for almost 3 hours and 40 minutes and aside for a short break for a pee I had not stooped once. I slowed a fraction to regain my composure and that is all that it took – within seconds the pack was pulling away from me and I was alone to face my demons. I battled on but it was no use. I was reduced to a walk. When I tried to restart my run it was as though the gearbox had seized. The engine was willing but I just could not get my exhausted cramping legs into gear. This continued as I ran a little, succumbed and then walked again. I had gotten this far, would never run a marathon again and had raised all this money on the understanding that I would complete the event – how could I quit now? I saw the white and red Magen David Adom (MDA) ambulances passing us. Could I hail them down and explain that I had given money at one of the fund raising events in Sydney and could I please have a ride home? What if instead I tried to swim the last couple of kilometres – were these muddy puddles deep enough? With less than 2 kilometres remaining one of the blind runners from Beit Halochem passed me, led expertly by his running guide who deftly steered him around the puddles, connected only by a flimsy black arm band. Now I know I could not stop. Who was I to complain?! I crossed the finish line after 4 hours and 46 minutes. The finally 8 kilometres had taken over an hour to complete. There was my son Levi, he had braved the rain to come back out again to cheer me across the line. Sabrina had completed her first 10 km event in 1:39 and Charlene – who started by only managing 300 metres only 2 months before – had run the entire race in 69 minutes. For us the pain and the struggle was only fleeting, but the challenge of competing and completing cleared our minds of every other distraction and the satisfaction will remain for a long time after the event. How much more so the members of Beit Halochem who live with the pain, scars and darkness every day. These events, the training and the competition gives them even greater release and satisfaction. Finally I salute those who run the ZDVO, their vision, compassion and selflessness knows no bounds.